Fluidized beds have applications in a range of industrial sectors from oil refining and coal combustion to pharmaceutical manufacture and ore roasting. In spite of more than 80 years of industrial experience and a tremendous amount of academic attention, the fundamental understanding of fluidized bed hydrodynamics is still far from complete. Advanced modeling using computational fluid dynamics is one tool for improving this understanding. In the current chapter the focus is on the application of CFD to a particularly challenging yet industrially relevant area of fluidization: fluidized beds containing Geldart A powders where interparticle forces influence the bed behavior. A critical step in modeling these systems is proper representation of the interfacial drag closure relations. This is because the interparticle cohesive forces lead to the formation of clusters that reduce the drag below that for non-cohesive particles. The influence on the predictions of the macroscale fluidized behavior due to mesoscale phenomena such as clustering is discussed. At present in the literature, approaches to representing the reduced drag arising from mesoscale phenomena is ad hoc. There is a pressing need for an improved understanding of cluster formation and for robust models describing it that can be incorporated into coarse grid models of industrial scale fluidized beds. Fluidized beds are widely used throughout various industrial sectors. The first application of fluidized bed technology is generally considered to be the Winkler gasifier for coal gasification in the late 1920s and new fluidized bed processes have been developed in nearly every decade since then. With the ongoing interest in fluidized bed technology, it seems likely that new applications will continue to appear in this century. For a description of the range of fluidized bed processes the reader is referred to the classic textbook of Kunii and Levenspiel (1991). The industrial success of fluidized bed technology is undeniable, however in spite of 8 decades of operational experience and research that has spanned the range from fundamental to highly applied, the development of a new fluidized bed process or the troubleshooting of existing processes continues to be an exercise that can be costly and fraught with challenges. Hence there is a continued need for research that will improve the fundamental understanding of the hydrodynamics of fluidized beds. 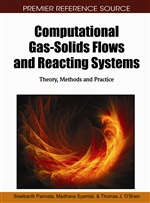 One means of improving this understanding is through advanced computational fluid dynamics (CFD) modeling, which is the topic of this chapter. When a bed of solid particles contained in a vessel is contacted with upward-flowing air, water, or other fluid, the fluid imparts a drag force on the particles in the bed. As the volumetric flow of fluid is increased, the drag force increases until a point is reached where the upward force of the fluid on the particle bed equals the downward force of gravity (i.e. the bed weight). At that point, the bed “unlocks” and may expand and is said to be incipiently fluidized. This process is known as fluidization or a fluidized bed. In what follows, the focus will be on gas-solid fluidized beds. It is important to note that the behavior of liquid-solid fluidized beds can be very different from that of gas-solid systems and hence the information presented in the current chapter is only applicable to the latter. The main operating variable in gas-solid fluidized systems is the superficial gas velocity, defined as the volumetric flow of gas divided by the cross-sectional area of the vessel. This ignores the presence of the bed solids, hence the terminology “superficial”. Figure 1 illustrates the trend in the bed pressure drop (ΔP) as a function of superficial gas velocity, Uo. As gas velocity increases, the bed remains in a packed state and the pressure drop associated with forcing the gas through the bed increases. Eventually the point of incipient or minimum fluidization is reached beyond which the pressure drop becomes constant with further increases in gas velocity. The corresponding velocity is called the minimum fluidization velocity, Umf and the bed voidage at this point is called the minimum fluidization voidage (εmf). It should be pointed out that certain very fine particles or very coarse particles may not fluidize at all. Furthermore, for those particles that can be fluidized, what happens at gas velocities beyond minimum fluidization depends on the size and density of the particles. The fluidization behavior of particles of differing sizes and densities is known as the Geldart classification (Geldart, 1973).